Many of the patterns and images found on Vietnamese silk scarves are traditional Vietnamese images or symbols. The Vietnamese and Chinese believe that incorporating positive symbols in their lives will inexorably lead to positive results in their existence. Not only were symbolic images incorporated in art and calligraphy, but also in clothing and household objects. Silk production was an excellent avenue to incorporate symbols. In Vietnam, historically no distinction was made between fine arts and handicrafts. Most objects produced were created from the hands of master crafters. These were artisans who had acquired knowledge from their ancestors, and this was kept within the confines of a village that specialized in a particular craft. The village of Van Phuc has been making silk for over a thousand years and is still renowned us for silk and brocade. Today the silk production maintains many traditions including the patterns and symbols on the silk. 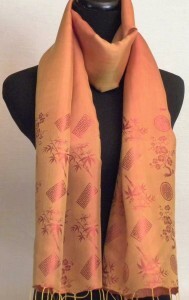 For example, on this scarf, bamboo is a symbol of traditional, old Northern Vietnam. The apricot blossom is a symbol of the new year or Tet in South Vietnam. Woven together on the silk scarf, the images can be seen as a symbol of national unity or harmony. Van Phuc silk village is in northern Vietnam, near the Chinese border. As a result they have traditionally been influenced by Chinese culture. This influence is seen by the utilization of Chinese symbols in their silk patterns. For example this pattern combines two Chinese characters for longevity and double happiness. These symbols are frequently used as a pattern in Vietnamese silk either together or combined with the apricot blossom and bamboo. These symbols often appear together on decorative items associated with Chinese New Year celebrations and weddings. The double happiness symbol is often found all over the wedding ceremony, as well as on gift items given to the bride and groom. The double happiness symbol signifies happiness and in Chinese culture, it means that the couple and their families would live together harmoniously if the symbol is put in their house.